UPSC IES Preliminary Exam 2018 Results /Engineering Services Exam Prelims Result 2018 / Engineering Services (Preliminary) Examination, 2018 Written Result ::UPSC Results 2018, UPSC Preliminary Exam Results for Main Exam, UPSC Engineering Services Qualified candidates list for Main Exam 2018, UPSC Indian Engineering Services(Preliminary) Examination 2018 Written Result: The Union Public Service Commission (UPSC) has declared the results of Indian engineering service (preliminary) examination 2018 on its official website. The roll numbers of the shortlisted candidates are available on the list, which was released that can be opened by clicking the link here. Shortlisted candidates will have to appear in the main examination to be held on July 1st. The commission will issue e-admit cards for the main exam to the shortlisted candidates around three weeks before it begins. 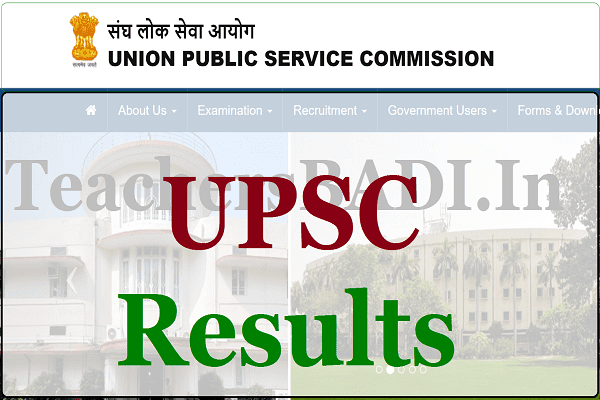 UPSC has also issued a write-up (about the results and the next stage of examination) along with the results, which can be viewed a the end of the story. Admit card for the main exam will be available 21 days before the exam date. In February first week UPSC came out with the official notification for Civil Services (Preliminary) and Indian Forest Services (Preliminary) exam 2018. The number of vacancies advertised under the Civil Services is 782 which also include 32 vacancies for candidates who fall under the Benchmark Disability category. The preliminary exam for both the services will be conducted on 3 June 2018. The last date to apply is 6 March 2018. The candidature of all candidates is provisional at all the stages of the exam - preliminary, main and the personality tests - subject to satisfying the prescribed eligibility conditions. UPSC conducts the engineering service examination at various centres across the country to fill up engineering positions in various departments of the central government. 2. The candidature of these candidates is purely provisional at all the stages of the examination subject to satisfying the prescribed eligibility conditions. The candidates declared qualified are required to appear in the Engineering Services (Main) Examination, 2018 to be held on 1st July, 2018. The qualified candidates are further advised to refer to the Rules of the Engineering Services Examination, 2018 issued by the Ministry of Railways and the Examination Notice No.01/2018 dated 27.09.2017 issued by the Commission which is also available on its Website. The candidates may download their e-admit cards from the Commission’s Website around 3 weeks before the commencement of the Engineering Services (Main) Examination, 2018. Candidates are also informed that marks and cut-off marks of Engineering Services (Preliminary) Examination, 2018 will be uploaded on the Commission website i.e., www.upsc.gov.in after the entire process of Engineering Services Examination, 2018 is over i.e. after the declaration of f nal result of Engineering Services Examination, 2018. No request for change of Centre/discipline for Engineering Services (Main) Examination, 2018 will be entertained under any circumstances. 3. Union Public Service Commission has a Facilitation Counter at its campus. Candidates may obtain any information/clarification regarding their examination/result on working days between 10.00 A.M. to 5.00 P.M. in person or over Telephone Nos. 23388088, (011)-23385271/23381125/23098543 from this counter.